Almost 80 percent of the world’s poor people live in rural areas and rely primarily on agriculture for their livelihoods (as per the World Bank’s reports of 2014 and 2016). Reducing crop loss in rural households could greatly support global food security under the UN’s Sustainable Development Goal #2 (Zero Hunger) and supporting more sustainable farming practices also influences Goal #15 (Life on Land). The goal of our EcoRobotics Program is to build best practices, share lessons learned and localize appropriate solutions for the application of robotics in sustainable agriculture, nature conservation and sustainable fisheries. 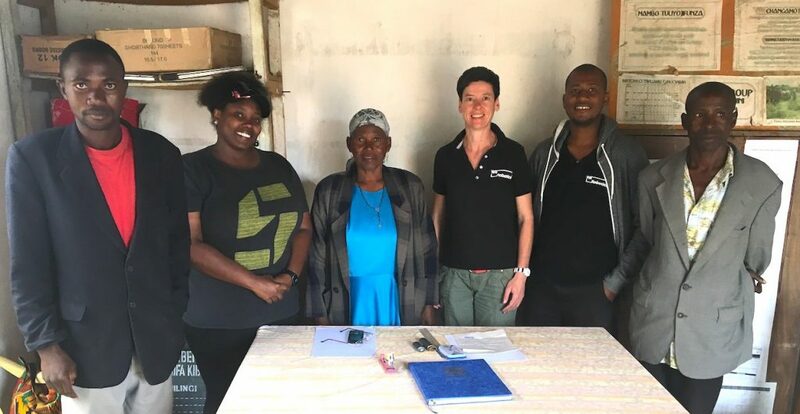 We are honoured that our first drone agriculture project in Tanzania is in partnership with a research project of a distinguished partner, the International Food Policy Research Institute (IFPRI). IFPRI’s Food Security Portal team is a partner of the Earth Observations for Food Security and Agriculture Consortium (EOFSAC), a new, multidisciplinary program commissioned by NASA and led by the University of Maryland to enhance the use of satellite data in decision making related to food security and agriculture domestically and globally. EOFSAC’s goals include increased food security and resiliency, reduced price volatility and vulnerability, and improved awareness and understanding of the applications of NASA’s and other satellite data products by users from a wide range of sectors. The pre-harvest loss assessment using satellite data requires the collection of detailed ground-truth data over the growing season. One of the main empirical methods to measure ground-based yield is based on farmer-reported measures of either production or plot area (or both). 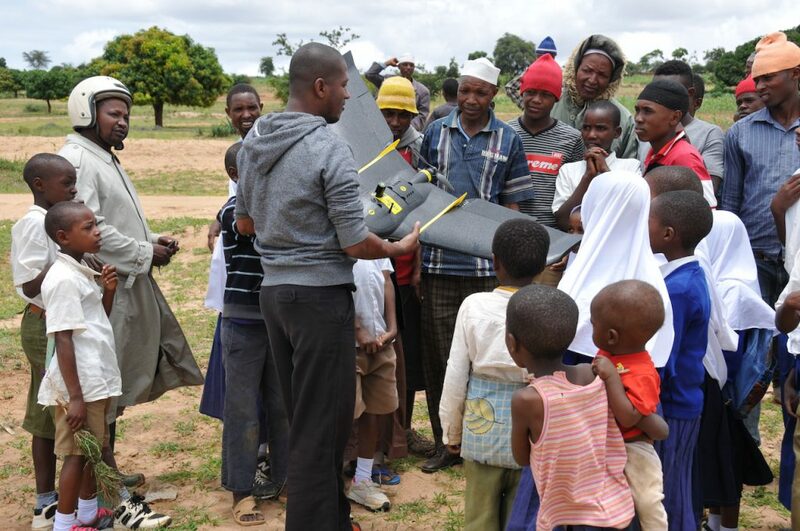 In late 2017, IFPRI approached WeRobotics to find a localized solution in Tanzania for their pilot research project that seeks to evaluate a new method for validating satellite data using drones. For IFPRI, finding local partners in Tanzania was a prerogative in order to have a sustainable solution for the future should this new method prove effective. In addition to acquiring high resolution aerial data, GPS-based measure of areas and a self-reported survey of smallholder farmers helps verify the data collected on this project. WeRobotics and Tanzania Flying Labs are keen to be partnering on this project to build on our expertise in the use of multispectral drone data could help to ground-truth satellite data. Our main goal is to contribute to building up local capacity in Tanzania to engage in such projects. And Agrinfo, one of the finalist teams of Tanzania Flying Labs’ “Drone-as-a-Service” Business Incubation Program organized last fall happened to be specializing in Drones for Agriculture. We proposed to IFPRI and UMD a collaboration between WeRobotics, Tanzania Flying Labs and Agrinfo, each bringing their expertise and creating a diverse team to tackle this challenging project and acquire both multispectral data to create NDVIs as well as GPS-based boundary measures of smallholder farms and additional household data acquired by means of a survey. The partners agreed that two rounds of data acquisition during the growing cycle would be ideal, one just before flowering and the other before harvest. 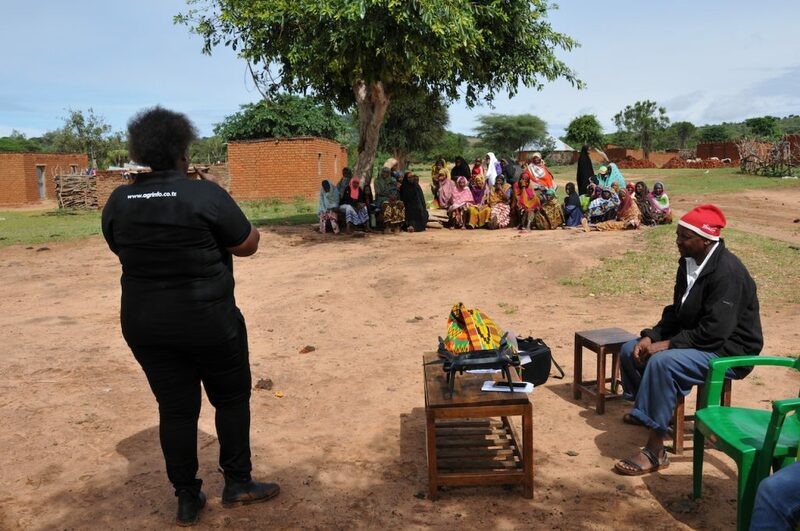 The focus was set on Chemba District in the northern part of Dodoma region, an area representative of both rural and remote smallholder farming in Tanzania. In early March 2018, our team made up of 11 people including project leaders from IFPRI, WeRobotics and Agrinfo as well as drone pilots, GIS experts and trainees, surveyors and drivers spent five days in three villages of the Chemba district. The main focus of this first round of data acquisition was local community engagement, decision on areas of interest and data acquisition. By speaking to village officials, local leaders of the farming community as well as the smallholder farmers (working their 1 to 10 acres fields with no other help then the strength of their arms to grow mainly maize, beans and sunflowers), we were able to learn more about their challenges. While pre-harvest loss is one challenge, so is better estimation of yield. In our discussions, we learned that many smallholder farmers don’t know the exact size of their farms and often over- or underestimate their size. This important basic issue can also have an influence on wrong expectation of yield. In our first day out in the fields, we were able to confirm the initial scope of our pilot project and will hopefully be able to use our data for both ground-truthing the satellite data as well as calculating and comparing the size of smallholder farms from their estimation to the actual size. Another important learning during this first round of data acquisition was the confirmation of a basic fact that is overlooked most of the time: weather. 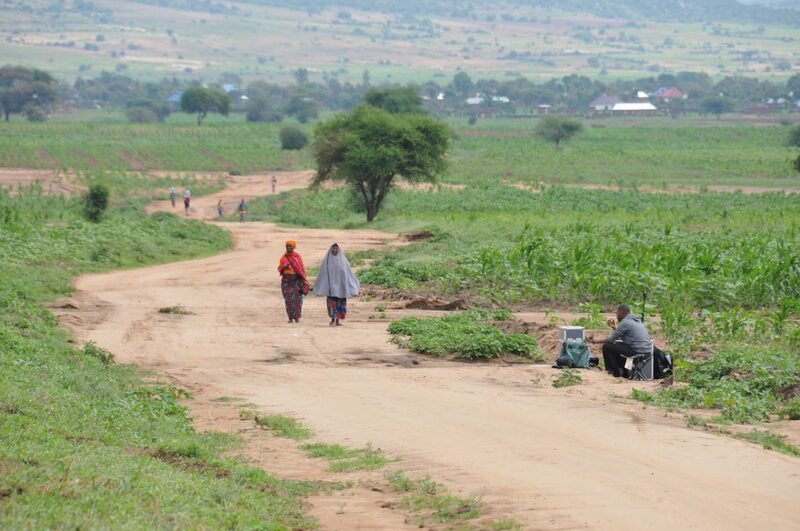 In Tanzania, growing cycles are directly linked to the rainy season which makes accessing remote rural areas, flying drones to acquire data as well as having timely satellite data disturbed by cloud cover challenging. Both these learnings show the importance of pilot projects to validate not only project scopes but also to learn more on possible project challenges. Despite the difficult weather conditions, we were able to collect multispectral drone data of 4 areas of interest, ranging from 50 hectares to 800 hectares as well as data of over 100 farm boundaries and information on the type of crop as well as yield history of each farm. Our second round of data acquisition is scheduled for late April and early May. This second trip will allow us to add more learnings to our process of acquiring and processing important amounts of high resolution aerial data and farm boundary data. We also plan to spend more time on community engagement, as it is thanks to the discussions with local stakeholders that we learn more about their needs to find ways of how high resolution aerial data can (or cannot) address them. This blog post is the first of a series of posts on the use of drones for agriculture. 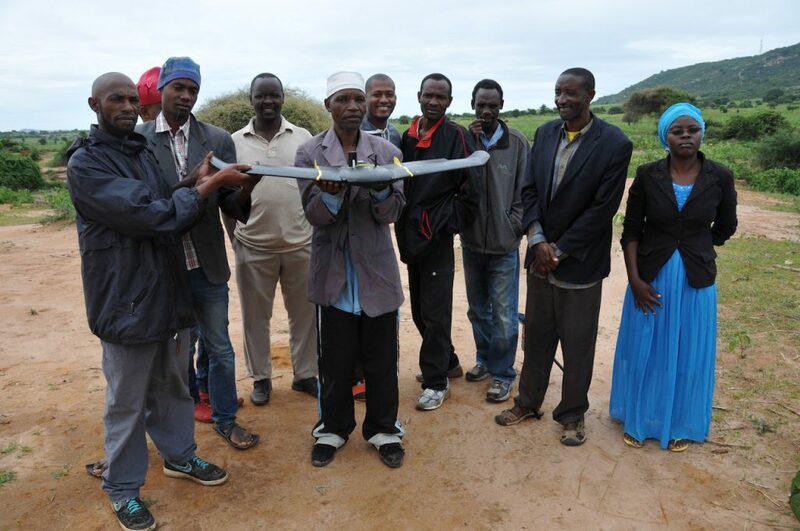 While we plan the second round of our data acquisition for IFPRI’s pilot project, we also explore on other possible pilot projects for drone applications in agriculture in Tanzania and surrounding countries over the coming year. We believe it is of highest importance to find answers and solutions on how drones can address the pressing challenges of smallholder farmers in a sustainable, viable and meaningful way that is adapted to local infrastructure, local cost of data and the value it can create for local farming value chains. Such localized learnings are also urgent as the African Union published a decision in February 2018, requesting the AU and Member States to harness drones for agriculture as one of three emerging technologies of relevance for African development. While this decision opens up many opportunities, it is important for solutions to take into account the local needs, context and value chains.